California State Quarters are the 31st variety in a series of fifty design changes over a ten year period from 1999 to 2008. This Quarter was released into circulation on January 31, 2005. The reverse of this coin shows an image of John Muir, a well known conservationist and naturalist. He inspired many Californians to preserve the natural beauty of the state. Also pictured is Yosemite National Park's "Half Dome" in the background, along with a California Condor. The Condor was near extinction but successfully re-introduced back into the wild. 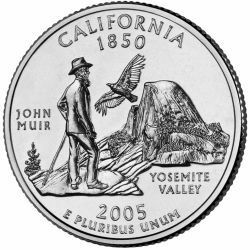 The reverse of the coin bears the inscriptions "CALIFORNIA 1850”, "JOHN MUIR", "YOSEMITE VALLEY" and "E PLURIBUS UNUM" along with the date of 2005.